Feb. 25: Tim LaHaye and Jerry B. Jenkins, authors of the bestselling "Left Behind" series, sit down with MSNBC's Rachel Maddow. Since 1995 there has been a massive cultural phenomenon that has pretty much taken place under the radar of the secular media. It started with the release of "Left behind: A novel of the Earth's last days," an apocalyptic tale of good and evil - a fiction book, but based on the Bible's Book of Revelation. In all, 16 bestselling novels were released in the "Left Behind" series by Tim LaHaye and Jerry Jenkins. To date the "Left Behind" series has sold more than 65 million copies, which means they've sold as many "Left Behind" books as copies of "Catcher in the Rye" have ever been bought ever -for pleasure or to sate the insistence of tenth grade teachers. They've even sold 10 million more copies than Merriam-Webster dictionaries, and that's been on sale since 1898! Commenting on the first book in the series Reverend Jerry Falwell said, "In terms of its impact on Christianity, it's probably greater than that of any other book in modern times, outside the Bible." 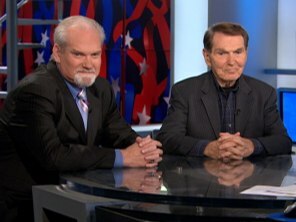 "Left Behind" authors Tim LaHaye and Jerry B. Jenkins sat down for an interview that aired with MSNBC's Rachel Maddow that aired on Friday, February 27th.